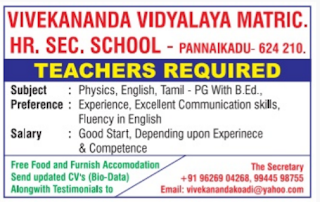 Vivekananda Vidhyalaya Matric Hr.Sec.School, Pannaikadu has advertised in THE DINAMALAR newspaper for recruitment of Teachers jobs vacancies. Interested and eligible job aspirants are requested to apply immediately. Check out further more details below. About School: A very good school with strict rules and regulations. 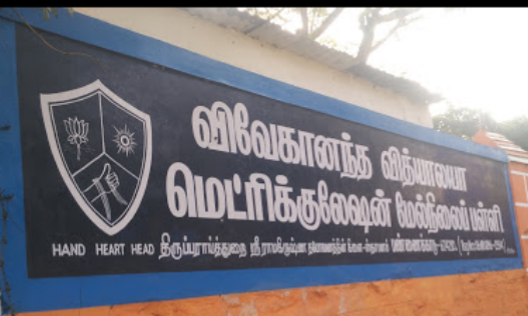 The location of this school is eye catching. The bajans conducted will be so good and happy that I was a part of it. The bus trip from pannaikadu was awesome. The annual day is a celebration here. Good school for boarding. Experience, Excellent Communication skills,Fluency in English. Free food and furnished accommodation. How to apply: Interested candidates may send updated CV's(Bio-Data) along with testimonials to below mentioned address.